It had been a very British week to begin with. With Toronto being inundated by a Brit Invasion (of the fashion variety), I found my thoughts wavering across the pond day after day. I couldn’t help it. I flew to London. First stop? 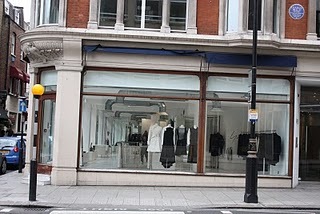 Mayfair – to Mr. Yamamoto’s flagship shop on Conduit Street. Why? Well, because my travelling companion loves her double-Ys. While Keiko went to Japan via Londontown, I took a paced browse through the store. Done in a soft cream throughout (think of a Hamptons kitchen) with weathered wood floors, also painted cream – the vanilla decor provided the perfect backdrop for the black, black, black, grey, white and blue pieces of modern art that hung on the hangers. 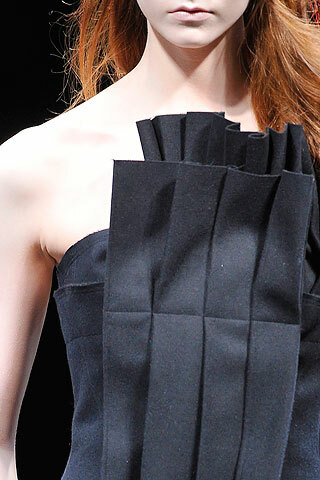 Breathless, not sleeveless at Yohji FW10. It wasn’t as sparse as one would imagine. This is not new minimalism, after all. This is a master’s work – and he is everywhere in this double-story space, which is as cozy as an oversized knit from his FW10 collection. 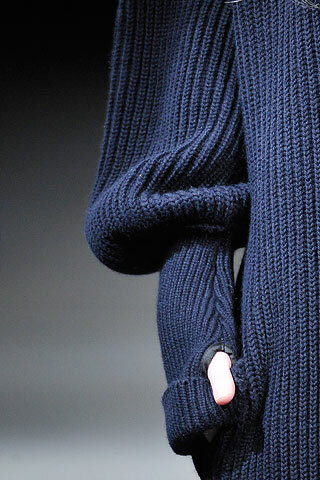 My current obsession - the longest sleeve with a thumb loop. The sun streams in (such luck in London!) through large windows and the creme de la creme is spotlighted amongst the cream. The fabrics melt in your hand – regardless of whether they are silk or the thickest wool. While at first glance, the entire story seems to be written in black, you slowly start to see the individual phrases and sentences of that story – which are sometimes ironic, sometimes satirical. Sometimes the pieces are like reading Eliot for the first time. You are not sure you understand it, but even on a first read, you know it is something special. 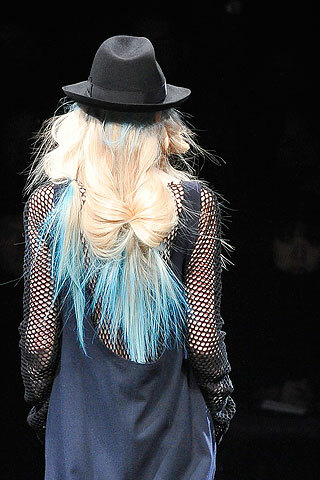 Split Decision: Japanese artistry rules the runway. Layers of long and short, of asymmetry, of proportional geometry are sometimes punctuated by the exclamation of a train to there, the comma of a pleated bustier, the completion of a thought with a polka dot. 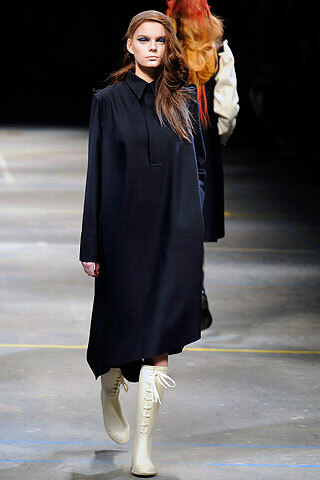 Gothenticity at Yohji. Your train, my goth queen, your train! Don't look back. No wait, do! You'll have flare to spare. It becomes a gallery experience with a live model – in this case, my friend Keiko – who pops out every few minutes to debut her selections. In some cases, we need to send in reinforcements to help her figure out the configuration of individual pieces. These are not shift dresses, my dears. It looks more cajh on the runway, but this dress was a showstopper - for some of us. 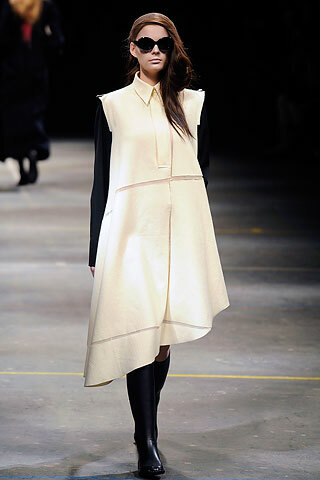 I love the women’s collection and there isn’t anything that doesn’t look good on Keiko, although the workmen peeping in through the window do dislike the strapless pleated wool gown and give it a thumbs down, opting for an edgier ensemble involving extra long Yohji Doc Martens instead. Only in London – the workmen prefer edge over elegance. Love it. This season has seen the return of the pleated girly skirt. This one is my fave. The classic knife pleat maxi skirt is back, too. J'adore. I'd have to wear it with a pointy Victorian boot. The upstairs of the store is the main women’s collection, the back of the store houses the men’s pieces. It’s the men’s collection that I coveted. 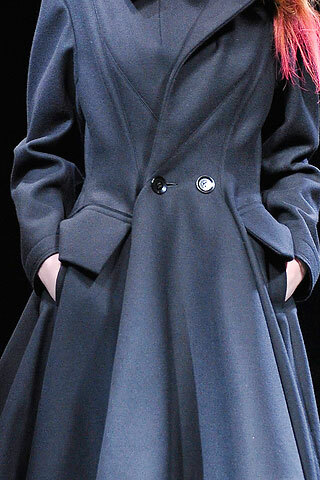 Mr. Yamamoto, can you please make those jackets for women? Each one is something you pick up, inspect and are in awe of. Patchwork, asymmetry, detailing – it’s all sublime. The clothes are very masculine, but so creative – architecture for the human body. The fabrics here are bliss, too. The photo does not do this suit - or fabric - justice. 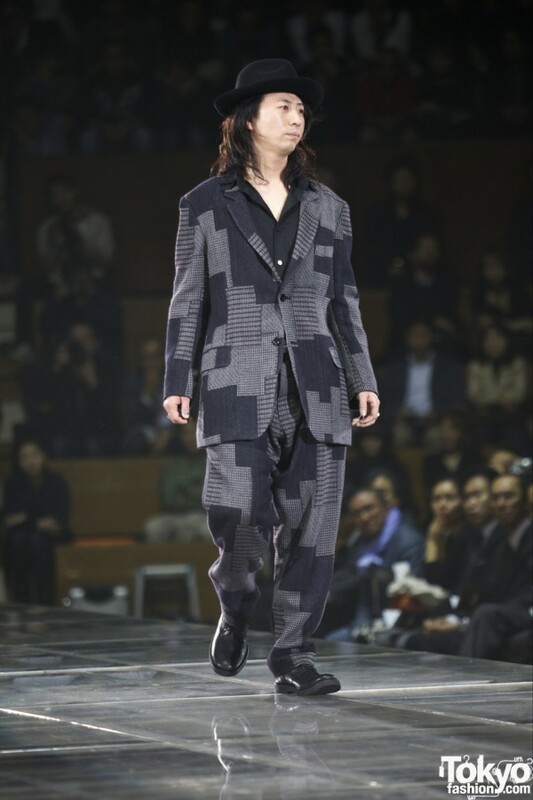 Yohji showed his men's collection in Tokyo earlier this year, after 19 years. 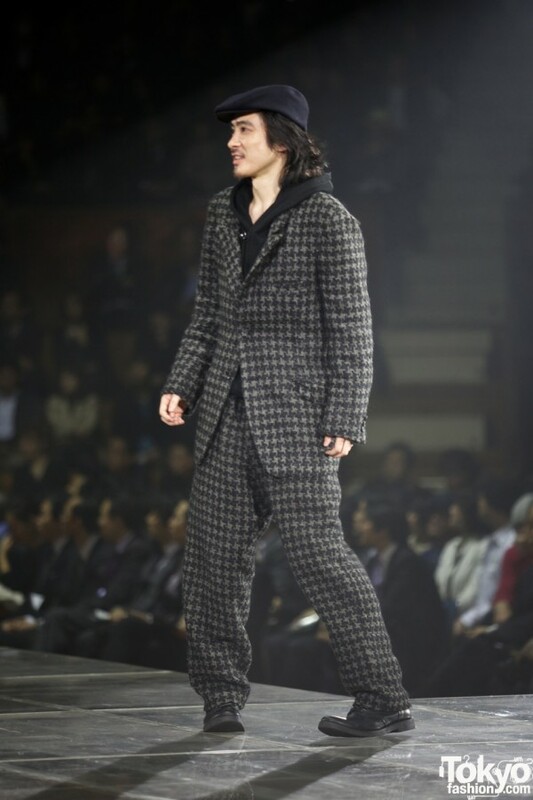 The classic houndstooth suit with a dandy twist at Yohji Yamamoto FW10. Blue for you, again. And that scarf. Downstairs, it`s the Ys collection (which I wasn’t familiar with until this visit – Keiko gave me a quick 101) and Y-3, the sportier line. Ys is slightly more functional than the main collection – and offers a wider selection of colours and by wide, I mean grey, white and steel blue. Our little visit to Conduit Street kicked off a wonderful start to our trip. The staff was as cozy as the store, recommending art shows and restaurants. Next time you are in London, get a little dose of Japan. Hats off to a design guru. 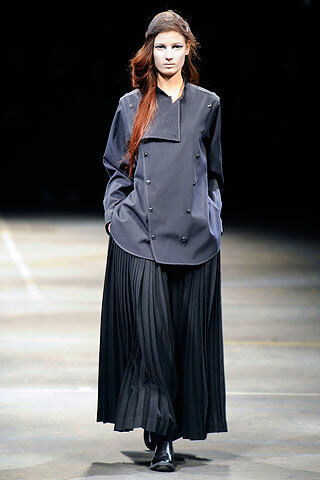 Yohji revival. There is a fashion god. It’s good to have you back, Mr. Yamamoto. 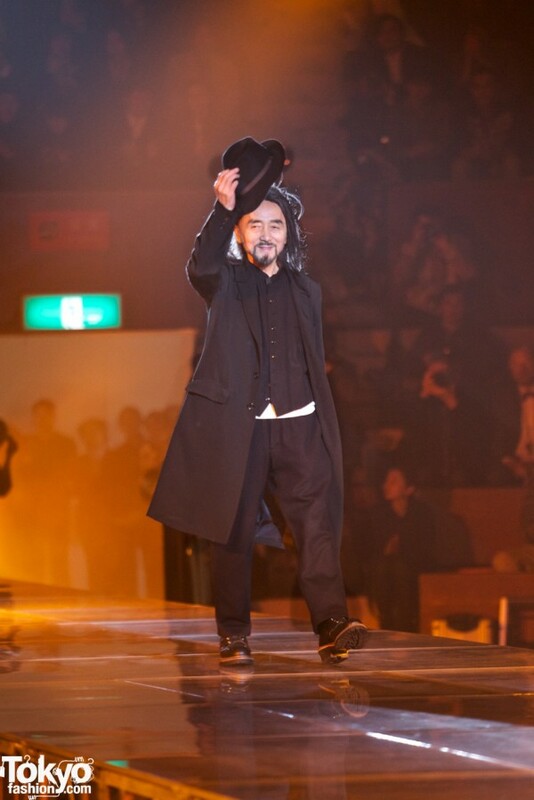 Look for much more Yohji in London in 2011 – the Victoria and Albert Museum is planning a huge retrospective of his work next March. Of course, I’ll have full details of the ex closer to the opening. Keiko and I marked the date in our calendars when I heard about it a few months ago. Store photo courtesy of Jasonyao Yao. Mr. Y and menswear images courtesy of Tokyo Fashion.com. All other images courtesy of Style.com.